A year and a half ago, we set out to find the perfect photo frame for our clients. Picture frames are a dime a dozen, and since we were literally putting our family’s name on the line, our search was agonizing. Pushing through the painful process is how we ended up with the frames we offer our clients today. Kind of a fun story that I thought I would share with you. 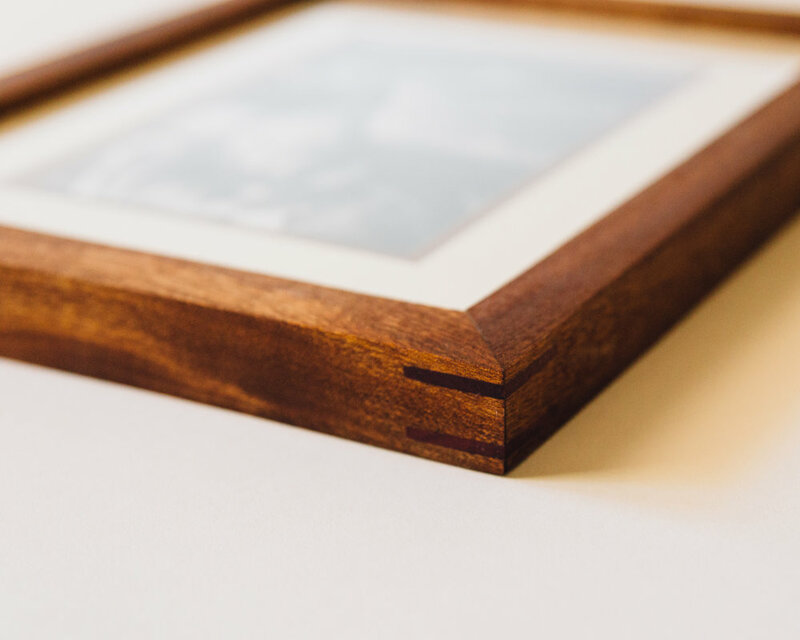 Just bear in mind that we take the word heirloom seriously, so searching for an affordable archival quality frame that complimented our photography style was no small feat in itself. The biggest problem I have personally experienced with photo frames, is them either coming apart at the corners or warping right on my wall. Both transformations look bad. The diagnosis after the fact is usually throw out and replace. Which annoys me. I like buying something once and not having to replace it. Which brings me to the main illness with most photo frames. See falling apart and warping over time is just the symptoms of a bad frame. How the frame was made determines how long that frame is going to live. And live is the right word to use here since most frames are made out of wood, and we don’t want to forsake the giving tree by just throwing it out someday. If you go to a frame shop and check out the different mouldings they offer, typically you will find an expensive wood veneer (a very thin sheet of wood) covering a chunk of wood that makes up the frame moulding. When you ask someone “What the frames are made out” of they say “Solid wood”. Judging by how light the wood is you know it can’t be a chunk of the hardwood veneer showing on the surface so you ask “What kind of wood?” Which they then respond “I don’t know…” But the problem is some woods are way better than others. That is why people spend money on stains they use to make cheap wood look like the more expensive wood. So what type of wood is under that veneer? Is it particle board? If the frame feels light, then it probably is. And the above conversation is a real one that occurred more than once. Why anyone would think particle board covered with veneer is solid wood is beyond me, but I can tell you that you have probably seen it behind one of your own frames when it gets a ding in the veneer. If you bust through that thin veneer, which isn’t very hard to do, the particle board becomes exposed. Not a pretty sight, throw out, and replace right? If it were solid wood, then a ding would reveal the same type wood behind it. Solid wood is a solid board made from a single tree. As a woodworker, that is my two cents. And frames should be made from solid wood. I agree with that much. Unfortunately, most frames are made from veneer glued on top of cheap wood, and most of the time that process happens outside of our Country. The mouldings get purchased and shipped in then are assembled to custom size by order at frame shops by cutting the moulding and stapling them together with a frame staple called a V-nail. If you look at the back of a frame you can see a few V-nails pushed into each corner of the frame holding the mouldings together. Which seems really sturdy. The problem is that wood contracts and expands with the seasons. So if the V-nail is stronger than the wood, it is going to tear out of it, if it is weaker than the wood it is going to bend. We wanted high quality frames, and discovered quickly that to find a frame that would last as long as the photographs they would be protecting, we needed to find solid wood frames that were made in America that didn’t rely on V-nails to maintain their shape. At this point, the frames we were looking at were so costly we knew we couldn’t mark them up enough to make it worth our while to even offer them. Distraught, I threw out the idea of me making them myself to Elise. She didn’t take me seriously and just benched the entire frame hunt. So that week I made a picture frame from solid wood. The frame was held together by not one V-nail, but wood splines. Wood joinery is infamous in Japanese carpentry, Temples built in Japan with joinery have withstood earthquakes and time unlike any other buildings made from wood. Essentially, there isn’t any metal hardware used. Wood is cut to fit together and therefore contracts and expands naturally together. When I showed the finished frame to Elise her jaw dropped. And I have been making frames for our clients ever since.